Company News Monday, July 16, 2018: Schneider Electric South Africa (Pty) Ltd.
Johannesburg South Africa, 20 February 2018 - Schneider Electric is proud to announce the Gauteng Win-A-Trailer Electrical Contractors competition winners. The winners are: Fausto Vietri (Noby’s Electrical), Jaco van der Westhuizen (GB Electrical Contractors), Riaan Kriel (TMK Electrical) and Frik Jacobs (Lesedi Corporate Services). The Partner Retail Business Unit launched the Win-A-Trailer competition last year in July. This was a four-month competition and digital campaign from 01 July to 31 November 2017. South Africa’s Electrical contractors had to purchase Schneider Electric wiring devices (S2000, S3000 or ZENcelo) to the value of R500, which granted them one entry into the Win-A-Trailer competition. 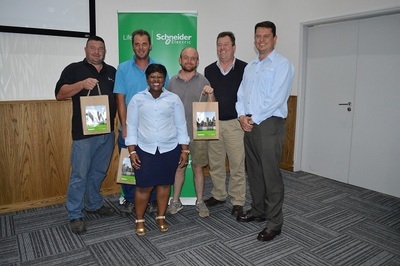 James Calmeyer, Vice President: Buildings for Southern Africa at Schneider Electric South Africa, congratulated the four Gauteng winners last week!